I haven't been online much this week, thanks to a crazy schedule in which I try to cram half of my summer activities into seven days. I've Twittered a little, only because it's easier to to compose something of 140 characters or less on six hours of sleep while chaos reigns around me than it is to blog something coherent. Exhibit A: The last sentence. The rest of you, however, have been writing fiends. I signed on to my Bloglines account today and saw at the top of the page "My Feeds (263)." So I did something I've never done before. I cherry-picked a few blogs I just had to read, and then I hit that magic, reset button that says, "Mark all as read." The fact that I've never done that before tells you something. First, it says I have a healthy streak of determination. "I don't care if there are 148 new posts today! I will get through them all!" It's a character quality that comes in handy when you are writing a breaking news story for a newscast that starts in just 60 seconds, even as the newsroom around you erupts with "f-bombs" and the screams of frustrated video editors. It's not such a great characteristic for Mom who has three children, because she might start to see said children as distractions meant to be blocked out so she can accomplish something, dang it, instead of precious gifts whom she loves beyond measure. Second, it tells you I have too many blogs in my Bloglines account, owing to my insatiable need for community and laughter. I am a sanguine, first and foremost. That means my motivating factor in life is fun. It's my drug, my high, my craving. I'm energized by people -- by talking to them, by listening to them, by the interaction. Blogging allows me to have conversations -- even relationships -- with intelligent, funny, strong people without ever having to leave my house. That's been especially important this last year since we're new the community -- read: I have virtually no friends here -- and I had a baby, which compounds the isolation. I would be a dried-up, brittle pod right now if not for the blogging world. But -- and this is an important but -- sometimes, it's good to step back and remind myself that I'm not as important as I think I am. 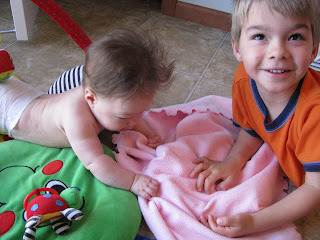 That my children and husband can be pretty darn intelligent, funny and smart -- even though they don't have blogs. That God is my satisfaction, not my list of accomplishments. In all honestly, I feel a little tremulous at the prospect of being away. I hate to miss things -- especially if they are fun. I hate to be out of contact with my friends -- especially if they are fun. I hate to feel like I'm neglecting something -- especially if it's fun. But I know having a week-long fast away from the blogging world will be good for me. It will be a time of refreshment. Plus, Corey doesn't believe I can do it. So now I have to, just to spite him. I love investing in my family. One of my favorite blogging friends said this week that, while she doesn't believe in karma, it would explain some of the ridiculous things that happen to her. I don't believe in karma either, but I certainly see a lot of ying-yang in my life. For example: Remember Monday, when I was only a spring garden cake away from Martha Stewart-like productivity? Anyway. Where was I? Oh yes. In the middle of nothing. 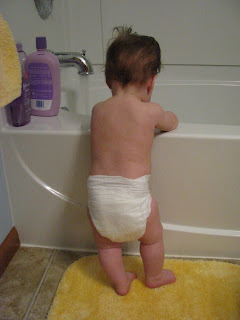 The only thing I really wanted to accomplish yesterday was the writing of a post for this blog. Yet because yesterday was the yang to Monday's ying, I couldn't get five minutes alone to save my ever exasperated life. The baby napped for the grand total of one hour. I spent that hour fixing lunch for Connor and Natalie. And the rest of the day was a blur of baby entertainment. Teyla has reached the age where her curiosity far out-paces her physical ability to satisfy said curiosity. She has the attention span of a young Elizabeth Taylor. 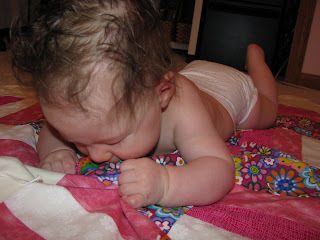 She is quickly bored with her old toys, yet her new toys aren't complex enough to hold her concentration for long. Worse of all, we won't give her any real food, which frustrates her to no end. Thus, when Teyla finally fell asleep for the night around 10:00 PM, I was too wiped out to do anything but sit on the couch and eat oatmeal M&M cookies in peace. For what it's worth, here's what I wanted to say yesterday. I totally wanted to play, because I love summer berries more than a grizzly bear fresh out of hibernation. But the more I thought about it, the more I realized that my favorite treatment for summer berries is to bake them in a pie or pour them over some shortcake, and neither of those applications is all that creative. Yummy -- yes. Original -- no. 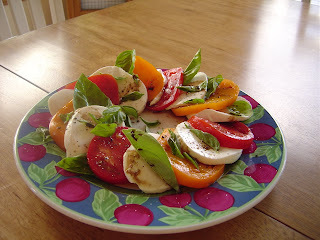 Instead, I'm going to send you over to my favorite food blogger -- Susan at Food Blogga. She posted a recipe yesterday designed to make use of the strawberries currently in season. Her unexpected twist -- pair the strawberries with mango to make a savory salsa for pork tenderloin. Amazing! The picture alone made me drool. This is definitely one I'm going to try. I urge you to do the same. Susan's recipes are always outstanding. - Write your own six-word memoir. - Link to the person who tagged you and to the original post. - Tag 5 more people. I've been thinking about this one for a while, and of course, I came up with all kinds of sarcastic offerings, such as "Never Fit Back Into Pre-Baby Clothes" or "She Died While Saying, 'Dude, Seriously!'" But I'm going to settle on something a little weightier. "She Believed God And Loved Well." If my friends and family can say that about me, I will consider my life well spent. And I'm going to tag ... well, no one. Because I hate tagging people with a meme that they've already done, and since Teyla will be waking up from her nap any minute now, I don't have time to research who's done what. So if you want to play, consider yourself tagged. If not, we'll move along guilt-free. The directions are: Pick up the nearest book. Open to page 123. Find the fifth sentence. Post the next three sentences below. The book that's next to me right now is the book I've been devouring for the last two weeks -- "Having a Mary Heart in a Martha World" by Joanna Weaver. It's a fairly new book, first published in 2000, but it has the feel of a classic already. (In fact, it's just been re-released in gift edition. The cover pictured to the right is the new design.) I think that's because it resonates with every woman, no matter her circumstances, temperament or personality. We all struggle to balance our driven-by-achievement Martha with our longing-to-worship Mary. Joanna does a beautiful job of exploring the nuances of these sweet sisters and -- more importantly -- teaching us to incorporate their best qualities into our own lives. I'll post my three sentences in a minute, but first, let me share with you one story from the book that's made a deep impression. It's a little long, but I think it's worth the kilobytes. Teri Myers, my pastor's wife from when my family lived in Grants Pass, Oregon ... tells the story of having company over for dinner one night. She'd worked hard all day on a beautiful meal -- four courses and a fancy dessert. It was going to be wonderful. But somewhere around the middle of the afternoon, Teri realized she was hungry. "I'd been so busy cooking and cleaning," she says, "I had completely missed lunch." But it was only four o'clock and the guests weren't due until six. "I always kept a hidden stash of Snickers bars," she says with a grin. So she grabbed a couple of candy bars and sat down to rest, enjoying her clean living room and beautifully set table. "It did the trick! My stomach wasn't growling anymore. I was able to take my shower, do my hair, and get dressed with plenty of time to spare." It wasn't until Teri sat down to dinner that she discovered the problem. "There I was with all that wonderful dinner I'd worked all day to prepare, but my appetite was gone!" The midafternoon snack had taken the edge off her hunger. She ended up picking at her plate as she watched everyone else dig in, enjoying their meal. "The Lord spoke to me at that moment," Teri says. "He showed me that we often fill our lives with spiritual Snickers bars -- things like friends, books and shopping. They may be good things, completely innocent things -- but not when they take the edge off our hunger for God." OUCH! But it's a good ouch. And now, for the three sentences. Hopefully, they'll whet your appetite for even more of this practical, powerful book. Well, that definitely inspired me. "Dear Jesus," I prayed the next afternoon as I sat down at the piano, "you know I'm not very good at this piano stuff. Would you do for me what you did for Andre?" I waited, but nothing happened. 4. I don't think I've pointed this out directly, but one of my favorite new features that debuted with my new design is the "Check it Out" section on the top of the right column. It's my chance to share articles or blog posts that have really grabbed me. They are the stories that I would be most likely to tell a friend if we went to coffee. "I read this really interesting/funny/well-written story online the other day...." So -- check it out! 5. I'm also Twittering. There's a widget on the left-hand column with updates. I resisted joining this movement for a while, but when Queen B joined in, I knew I would have to follow suit. I'm even thinking about getting my nose pierced. Not really. But I think the Queen is cool. 6. Finally -- Ahhh! Blessed relief! -- I've read a lot of posts the past few weeks about people preparing for summer travel, and I have to say, I'm somewhat fascinated by the number of bloggers who mentioned they haven't flown in years. YEARS! That shocks me. I was aware that our family flies more than most, but I figured that was part and parcel of having family flung across the U.S. And of course, Corey is a serious business traveler. He is in the elite 5% of Americans who fly more than 10 times each year. But people who haven't flown in years? Sometimes, since before 9-11? That's amazing to me. So share your experience: How often do you take to the skies, on average? And why do you think the number is as small or as large as it is? Remarkably material also is the writer's attempt to control his own energies so he can work. He must be sufficiently excited to rise himself to the task at hand, and not so excited that he cannot sit down to it. Like a good little narcissist, I see about ten shades of me in that quote. It has that moment of recognition -- the clarity of seeing something I couldn't name be called out by someone else. It applies as aptly to life as it does to writing, does it not? We only have today. Lord, teach us to savor each moment and to day by day with holy abandon. Yesterday was a ridiculously productive day, even for a coffee-fueled, adrenaline-junkie like me. 1. I dusted and vacuumed every room in my house. 2. Changed all the sheets and towels, which were then washed, dried, folded and put away. 3. Cleaned all the bathrooms. 4. Cleaned the kitchen and Swiffered the kitchen floors. 5. Folded and put away six loads of laundry. (These were clothes that had been washed over the weekend. Please note: This does not count the linens.) I also de-stained a few items of clothing that had sprouted a mysterious yellow stain during the washing process. Three or four scoops of Oxy-Clean and scalding hot water, and the stains were gone. I love it when a stain-removal plan comes together. 6. Made 5 dozen oatmeal M&M cookies. From scratch. 7. Played with the Teyla for long stretches at a time. Smiled at her gummy grin until my cheek muscles started to ache. 8. Dead-headed Corey's Father's Day hibiscus plant. Teyla helped, although I'm not sure the flowers she pulled off were past their prime. 9. Made chicken vegetable melt for dinner. From scratch. 10. Played Uno. Lost. Again. 11. Finished organizing the digital pictures I took in May, including approximately 1,345 pictures of Teyla. 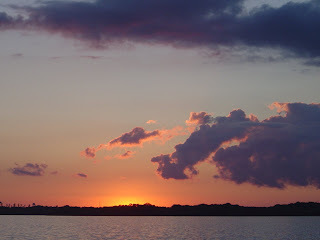 Uploaded the pictures to my digital file-sharing site. 12. Ate blackberry pie with Corey before bed. And how in the world was I able to accomplish all this, you ask? Simple: Connor and Natalie played outside with their neighborhood friends from 11:30 until 5:30. There were no interruptions. No stops to break up fights. I didn't have to field any wails of "Mom, I'm bored!" or "Mom, I'm hungry!" or "Mom, I want to watch TV." Summer, I love you. Please don't ever leave me. Last summer, a couple of weeks before we moved, we threw a birthday party for Natalie. It wasn’t a huge affair as modern birthday parties go – just a few friends from her kindergarten class and a theme of "summer fun." We grilled some hot dogs, played some games, busted a piñata and ate cake and ice cream. 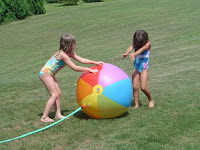 The party ended on the front lawn, where the kids rolled a sprinkler ball around the yard, shrieking and laughing. 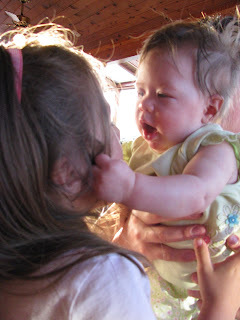 One of my friends came to gather her daughter from the party, and knowing this was the last time she would see us before the move, she said a special good-bye to Natalie. 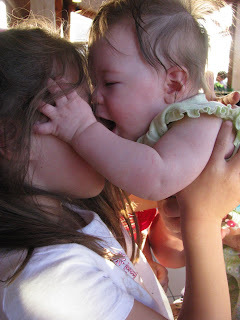 And she skipped off to spray water at her brother and give Kendra one more hug. Lauri and I burst into laughter at the simple self-assurance displayed in Natalie’s voice. “Oh, if only we could feel like that forever,” lamented Lauri. 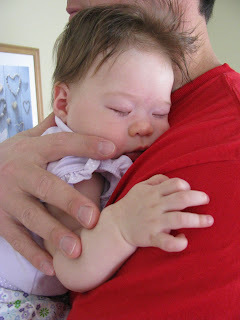 That’s what the strong, sure love of a father does for a little girl. 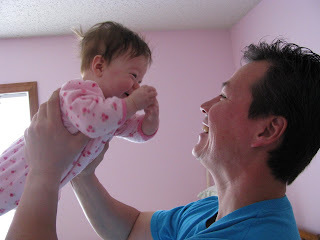 Because if her Daddy loves her, she must be lovable. She knows her worth -- and it's immeasurable. Happy Father’s Day, Dad. And Corey? Keep up the good work. I love what you're building. Confession time: What you are about to see is not my current garden. If I were to show you my "yard" right now (and yes, the quotation marks are appropriate in this case), you would see a strip of grass at a 45-degree angle on the hill leading up to our front door. And even that is maintained by the town home association. So when Lisa announced her intentions to hold a Garden Party, I lamented that I was a year too late to play. Being the very picture of graciousness, she told me I could join the party even with old material. Confession number two: Five years ago, I hadn't grown so much as a dandelion in my yard. Corey is the gardener in this family, and he's dang good at it. 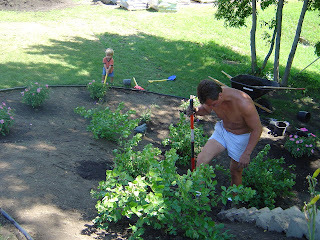 At our last house in San Diego, he took a month off work to landscape our backyard. A MONTH! And when he was done, it was a slice of paradise -- Gerber daisies, scads of hibiscus bushes, bougainvillea, a Meyer lemon tree, yucca, impatiens, daisies, agapanthus. Too bad it was reduced to ashes a few months later. Anyway. When we moved back to the Midwest five years ago and suddenly had yard the size of our old neighborhood (a little more than 1.5 acres), I got an itch to develop my green thumb. 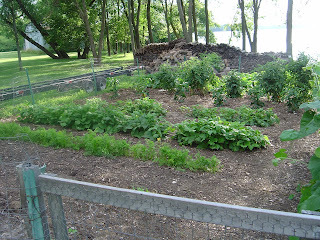 Specifically, I wanted to try vegetable gardening. So Corey, who loves to spend time outdoors, bought a industrial-strength tiller and got to work. We were stunned at what he plowed up. It was some of the richest, darkest soil I've ever seen -- loam, the black gold of the gardening world. What I'm saying is -- that soil made me look good. Because that year, I threw about 20 different vegetables in the garden, did nothing else but weed, and everything grew like gangbusters. That was all it took for me to get the gardening bug. Each year, I inched out of my shell a little further, planting more exotic vegetables, trying new varieties. And each year, I was thrilled with the results. 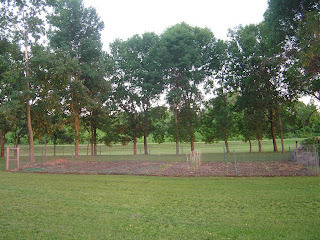 Here's the garden fully planted in 2005. It's early June in this picture. 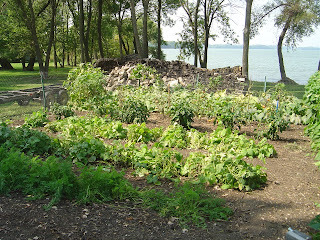 And here's the garden just six weeks later. In case you're interested, I think I've got carrots, sugar snap peas, green and wax beans, peppers, tomatoes, zucchini, cucumbers, pumpkins and squash in there. 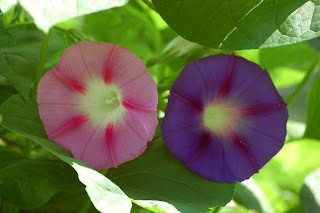 I also planted a hedge of morning glories on the northern fence each year. Because they are the Brangelina of the flower world -- gorgeous and, um, quite prolific. And here's the garden in early September. By this point, I was plotting ways to get rid of the tomatoes and zucchinis that were multiplying like mutant bunnies in my yard. Thankfully, I had many friends who welcomed organic, homegrown vegetables. 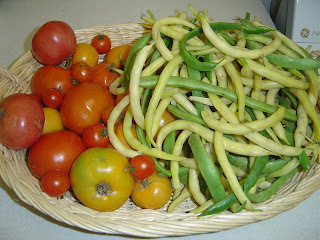 And gosh darn it if vegetable gardening didn't make it easy to eat a rainbow everyday. Now I miss my garden. I'm growing two tomato plants and a few herbs in pots on my deck. But it isn't the same. Part 2 of this story would be the landscaping that Corey did around the foundation of our lakeside home. It involved two weeks outside in 90-degree heat, more than 200 plants and trees, almost 1000 bags of mulch and lots and lots of sweat. Instead, I'll leave you with the view from my garden of yore. God's glory was always right in front of me, whether it was in the form of a perfectly red and juicy tomato or a sunset that was glory defined. And that's why I love gardening. I was on the deck with Teyla yesterday afternoon, trimming back my cilantro, when I heard Connor messing around in the fridge. "What do you need, buddy?" I called without turning around. "I can't get the lid off this milk!" he answered. "Just hang on a minute," I replied. "I'm almost done here. I can help you as soon as I come in." Thirty seconds later, I walked into the kitchen to find a 4-ounce bottle of freshly pumped breast milk sitting on the counter -- with 2 ounces missing. Connor was standing to the side with a guilty look on his face. "Buddy, did you drink Teyla's milk?" I gasped. He hung his head. "It tasted funny." In the end, I chose laughter -- because Connor did enough crying for both of us. I hate to pump -- in fact, yesterday was the first time I've pumped since Teyla was born, and even that was only done because I want to start introducing a bottle to her so Corey and I can go on a date again this year. 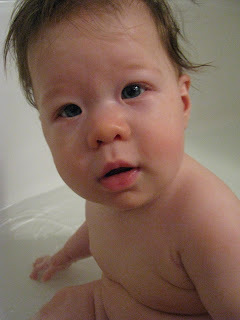 So I guess my startled reaction when I saw 2 precious ounces gone really threw Connor for a loop. I think his lip quivered for a full 30 minutes. He felt awful. And it truly wasn't his fault. He didn't even know what the little bottle was. It just looked interesting to him. I guess it just illustrates the proverb: Don't cry over spilled milk. Unless it's breast milk. Then sob. But now, the development is finished and full. There are quite a few young families around. Which means, for the first time in their lives, our kids have neighborhood friends. I'm delighted they have some playmates. Yesterday, the first full day of summer vacation, they spent the better part of the afternoon running around our building, playing tag and riding bikes and having squirt gun wars. But since our old house was in the country (read: no neighbors), I feel a little out of my element here. What's proper neighborhood etiquette? How much do I need to supervise? Do I get involved when a minor skirmish breaks out? ("That's my toy! I was playing with it!") If my kids are inside someone else's house for more than an hour (an activity which was initially approved by all adults involved), do I need to go check on them to make sure they aren't overstaying their welcome? The fact that I have a young baby to care for adds to my unease. For example, Teyla has a miserable cold right now, and she spent the better part of the afternoon yesterday clutching my neck, crying and moaning pitifully. On one hand, I was thrilled that Connor and Natalie were having fun -- away from the computer and TV -- which freed me to focus on Teyla. On the other hand, I felt vaguely guilty that the older kids were off my radar, so to speak. Except for the times they ran in front of our windows, I wasn't really sure what was going on. But maybe that's OK? I don't know. 1. 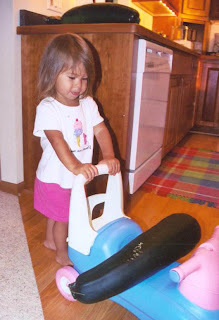 You need to share your toys (bikes, squirt guns, sidewalk chalk, etc.). 2. You shouldn't expect or demand that your new friends will reciprocate with their toys. It would be nice, but it's their decision. 3. Never go into someone's house without asking Mom or Dad for permission. 4. If your friend wants you to come inside, make sure it's OK with their Mom or Dad. What else do I need to know, experienced parents? I need "Neighborhood Etiquette for Dummies" here. Enlighten me. I didn't play sports as a child. In fact, the closest I've come to athletic prowess is getting certified to teach aerobics. Needless to say, I don't have fond memories of P.E. class. I also don't have much of a competitive streak. Hopefully, that sad little confession will help you understand why, when I have a giveaway here on the blog, I tend to feel a little guilty that someone has to lose. I feel a kinship with the losers, with the picked-last-for-the-team players. I'm an argyle-shirt short of being a female Charlie Brown. 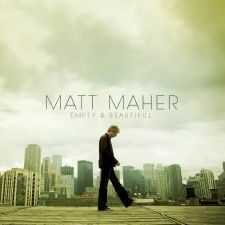 But alas, I only have three Matt Maher CDs to give away. And since we still own two homes, I don't have the money to run out and buy a copy for everyone who entered the contest. 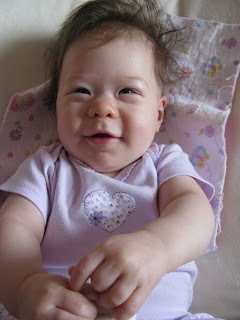 I do believe she's the sweetest, happiest baby ever. Not that I'm biased or anything. She wakes up cooing. She whole body wiggles when she sees someone she loves. Corey calls her "she who smiles with her whole body." Exhibit A: The video below. I took it this afternoon when I went to get her after her nap. Watch her face. Give me a minute. I think I need to watch that again. Oh my word. I could watch her smile forever. Oh yes. Another thing we've learned about Teyla during her first five months is that she's both physically strong and mentally determined. She seems to be reaching milestones quicker than the other kids did. 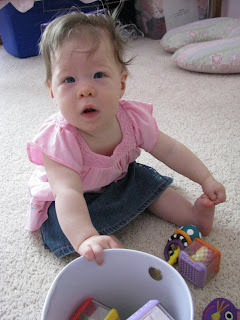 We theorize this is partly due to the fact that she has active and interactive older siblings. But who knows? It might just be her temperament. 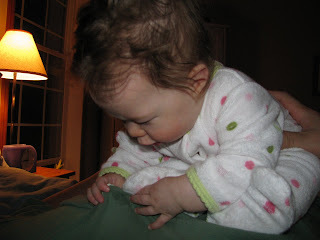 For example, she started sitting up, albeit imperfectly, about two weeks ago. 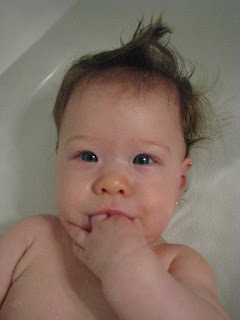 If the princess ever does have a trying afternoon, bath time is a sure fix. She loves to be in the water. Princess McWhiny doesn't stand a chance in here. "I'm sorry. Did my Mom just say I'm whiny? Surely she jests." Playing with her big brother and sister also rank high. So does chewing on them. "I just want one little taste!" ... who is also known as Chief Snuggler. Well, maybe Vice-Chief Snuggler. I'm not sure I'm ready to relinquish my title yet. After all, I didn't make a name for myself in athletics. This mommy gig is all I got. And truthfully? I'd rather have this than a trophy any day. Should I tell you that I've eaten nothing but celery and dry, wheat bread today, to make reparations for last night's dinner? And I'm against lying, generally. In reality, I've had hot Kashi with bananas, a big mug of coffee with toffee nut creamer, a handful of peanut butter M&Ms, a turkey sandwich and about 3 servings of Pringles. And it's only lunchtime. Clearly, I'm not a big believer in penance. For starters, Corey is on another business trip. So I'm single-parenting again. This is his 10th trip this year, and I'm starting to hit the wall. Second, it's cloudy and cool here. Still. And it's June. When I want to swim. And the seven day forecast looks like this: rain, rain, cloudy, thunderstorms, rain, rain, suicide. I would never survive in Seattle. I must have my sunshine, and right now, it's not happening. Third, I had a bit of a mental flip-out yesterday. I haven't talked about this much on the blog, but we own two homes right now. (We're practically the Trumps.) 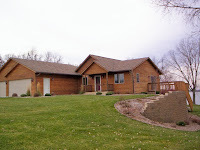 Our old home (left), which is beautiful and on a lake, has been on the market since November 2006. (That's not a typo.) It's in a small town, where the median-priced home is under $100,000. (If you live in California, I'm sorry you just fainted.) And our home? Well, we bought it when we moved back to the Midwest from San Diego. So while it's an average-priced normal home to us, it's considered "high end" in the small town where we lived. So it sits. We try to leave it in God's hands, because He surely knows when the right buyers will come along. And most of the time, I have a great deal of peace about the situation. But yesterday, the dam in my mind just broke loose. Since it's the beginning of summer (which means "it's the season to move" in the Midwest), we've had quite a few families come and look at the house the last few weeks. I think my heart was growing quietly hopeful that the time had come. Instead, our real estate agent called yesterday and said all interested parties are no longer interested. They don't think the house is worth the asking price, so we're back to square one. Mentally, emotionally and spiritually, I lost it. Fear and worry trampled my heart and took it over, like the aliens do in one of those cheesy science-fiction movies with taglines like "It's a bad day to be human." I was just consumed. Overwhelmed. "What if the house never sells? What will happen to us when Corey switches jobs next time? How are we going to keep affording the double house payments? What if we are forced into foreclosure or lose all our savings over that silly house? What are we going to do? More specifically, what can I do to get a buyer right now?" Of course, the answer to all of that is, "Be still and know that I am God." Easier said than done, though, when your eyes are fixated on the situation and not on the Creator of the Universe. I called a few friends and left urgent prayer requests on their answering machines. I talked to Corey (who was also wearing The Cloud of Despair), my sister, my Dad. 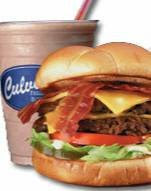 Honestly, the relaxed pace, the kids laughter, and, yes, the sweet, creamy malt helped me to let it all go and leave it at the feet of my Savior. For those of you who know my God, I covet your prayer in this area. Corey and I cannot make any plans for the future until that house sells. God is teaching us much in the waiting -- something neither one of us is good at, by the way -- and we always come back to His wisdom and His timing. But this waiting. It's hard. There are so many big decisions we'd like to make. But until that house sells, we're on pause. Pray that we'll have peace and faith in the pause -- and then incredible joy when God presses play. I don't know if God works this way with other people, but when He wants to teach me something, He repeats it. Repeatedly. I suddenly find myself faced with the same truth or idea over and over again. The thought may be presented in different contexts and come from different sources. But each one has the same resonance in my heart. It's as if God is saying,"Consider this. Measure yourself against this. Be prepared to change." 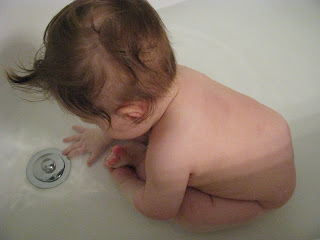 Eugene: Keeping a weekly Sabbath -- a day my wife and I define as "praying and laying." A day we don't do anything that has to be done. When we realized that the command to keep a Sabbath is one of the most repeated in Scripture and yet the most ignored in our culture, we had to readjust radically the way we were living. No other decision has made as much difference to our lives across the board. It has impacted our marriage, children, church life, friendships, writing ... the works. Sabbath-keeping shifted our attention from what we were doing for God to what God was doing for us. Our work became subsumed in His. The keeping of a modern-day Sabbath is a fairly new idea in most Christian circles. Certainly, it's not a practice I grew up with, and I grew up deep within the Evangelical subculture. (My proof: I get 98.5% of the jokes on Stuff Christians Like. Jon is my people.) So when I heard Eugene Peterson credit Sabbath-keeping as the number one spiritual practice to impact his faith, I sat up and took notice. Since that time, I've done a fair amount of research on the Sabbath. I know its history, its traditions, its benefits and dangers. Many people I know and respect practice the idea of Sabbath in different ways, and there's both freedom and beauty in that. But yet today, two years later, I still struggle with integrating Sabbath into my daily, wife-mother-cooker-cleaner life. As most Moms know, there are no days off in this business. And I'm OK with that; really, I am. I love my life, and I know it won't always be this way. But right now, I can't imagine taking a whole day to "pray and lay." I love the concept. But I don't know how to fit it into my practical, everyday existence. I have some thoughts about this, which I'll share later in the week. But for now, I'd like to open it up for discussion. Do you practice a Sabbath and/or know someone who does? (Link to Wiki there, if you have no idea what I'm talking about.) If so, what does it look like? If not, why not?